Just a little over a year ago, Quinn Seong Wook joined our family as a cute little 9 month old. Little did we know what this little ball of joy and energy would do to us all! Quinn turns two today and his incredible personality and attitude still amazes everyone. An early start to life full of more turmoil than most every experience, our little boy is truly a shinning example of God’s joy. He keeps us on our toes every minute of the day too. He is “ALL BOY” as they say. One minute he is a one-man terrorist organization, the next he is cuddly and cuter than a bug. Overall, now we know just how incomplete our family was before him. He is the caboose to our train….so we hope. Happy 2nd birthday Quinny the Pooh! Two weeks ago the girls started swimming lessons. At the time, they were sort of warming up to the water at our pool at home. Just 14 days and some major episodes of crying later, they don goggles and swim like Shamu! They still have a ways to go before they are quite as good as their Sea World hero, but it won’t be long. Their brother loves the water and nearly drowns himself trying to get in it, but considering where the girls were just a few weeks ago, we are more than thrilled. We are finally getting our monies worth out of our own blue lagoon! I love football season. Thank God the Rangers and Astros both are still in the baseball hunt or my sport world would be drier than a 100 degree day in Dallas, but still, nothing gets me more fired up than knowing football season is just around the corner. And for those of us season ticket holders stupid enough to mortgage our great grandchildren’s future, their new home in Arlington recently topped $1,000,000,000 to build. My office sits on the 6th floor of a building just down the street so we have watched it go up daily now since 2007. I have been tracking this montser via photos for the last two years. Below are a few with a link to them all. Enjoy. 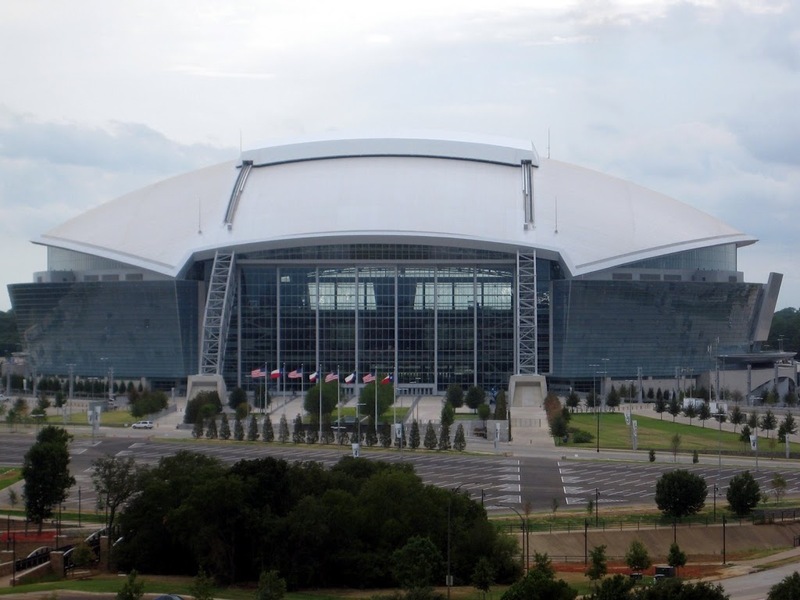 We take a tour next week – more photos of the incredible Jerry Jones world will be posted then. Chloe and Sidney are learning to love the water. 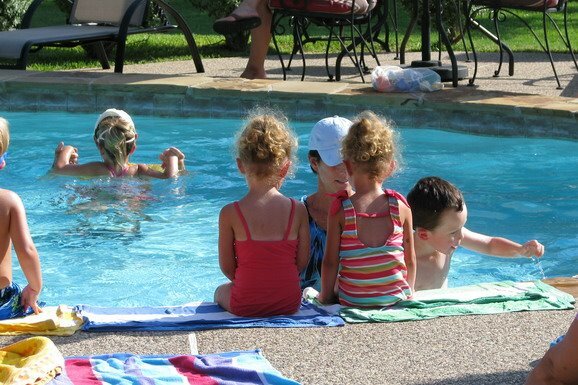 They started taking official swimming lessons Monday and despite occurences of Julie having to chase them around the pool with them crying hysterically, they are getting better and better each day. After the first lesson Chloe proclaimed, “We are not going back there.” LOL. Finally on day 4 they are both jumping off the side, swimming a little under water and getting more brave. Our little babies are growing up. Their brother? Well, he might as well have been born in water with duck webbed feet. 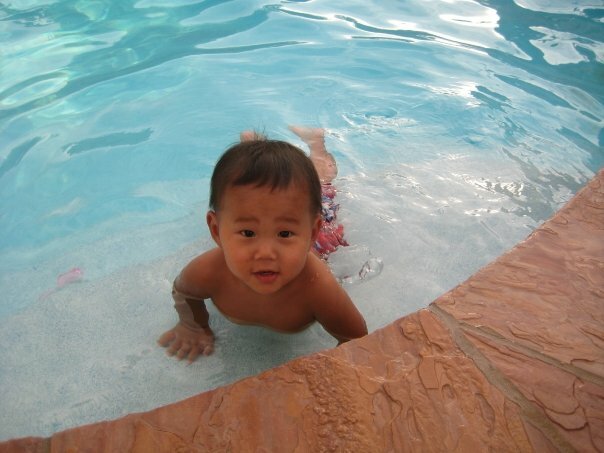 He LOVES the pool….